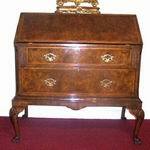 Magnificant Inlaid Burr Walnut Ormolu Mounted Kidney Shaped Antique Desk With Two Drawers. 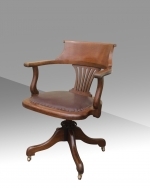 Quality Rare Victorian Mahogany Ballon Back,Carver,Desk Chair. Strong of Joint and Superb Colour. 23ins wide x 23ins deep x 35ins high. 31.75ins x 15.75ins deep x 29ins high. 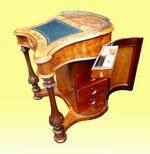 A Stunning Quality Antique Inlaid Satinwood and Kingwood banded Kidney Shape Desk of Petite Proportions with Burgandy Leather Tooled Hide . 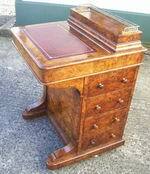 A superb quality antique ebony lined mahogany Carlton House desk. A superb quality antique ebony lined mahogany Carlton House desk. Fitted with its original writing surface with a writing slope on an adjustable ratchet, is surrounded by the desks superstructure with bowed cupboards to the corners and six small drawers to the centre. The cross-banded top surface having a brass gallery and the brass inset letter apertures and a further 2 banks of drawers. The table with 3 drawers along the front and standing on square mahogany ebony line inlaid tapering legs ending in brass cup castors. 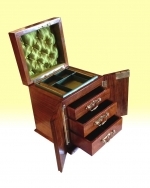 Fabulous burr walnut antique writing box slope with secret drawers and blank inlaid brass cartouche and escutcheon with subtle inlaid brass strip surrounds. Three wide brass protective corner pieces to each of the four verticals. Brass bands that extend down the full depth to the rear of box.Robust inset brass side handles. 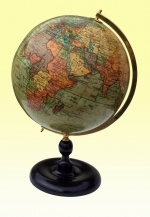 All brassware stated is original and complete. The side drawer is accessed by removing a brass locking rod located to the box interior. 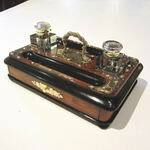 The drawer features the original lacquered interior (a sign of quality). The lid closes perfectly square on the original brass hinges and opens to reveal an impressive interior.Note the presence of coromandel veneer and the inlaid brass surround to the aperture for the brass rod that secures the side drawer ( more signs of quality). 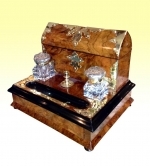 The office section comprises of, stamp slope, dished pen tray with storage space beneath, small lidded section with original brass knob and twin ink-pot sections. 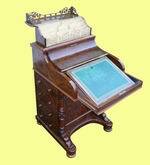 The writing platform has had a replacement gilt embossed leather fitted that is free of tears and stains. Both storage sections beneath the writing surface are in very clean condition. 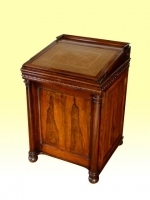 The secret drawers accessed by the usual method of raising the divider between the stamp slope and inkpot section, the concealing panel springs open nicely to reveal the three drawers with walnut veneered fronts. Yet another indication of quality is the lock. Clearly stamped Bramah. There is an additional lock that secures one of the two storage sections beneath the writing platform and the secret drawers. 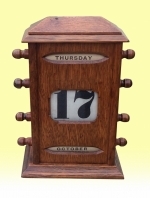 This is a fine quality item, of a classic design that displays beautifully. 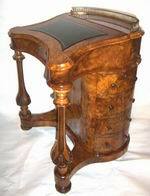 Antique Burr Walnut Kidney Shape Desk With Tooled Leather Top. 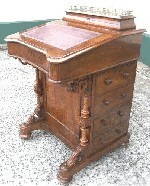 Desk With Tooled Leather Top. 43ins x 22ins x 28ins high. 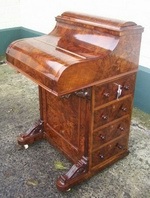 Superb Very Large Antique Mahogany Partners Desk. 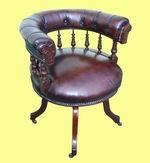 Extremely comfortable antique captains desk chair with upholstered leather seat pad with stud detailing. Polished and waxed light oak finish. Fully working adjustable rise and tilt mechanism. 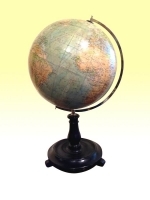 Swivel base on 4 original brass castors. 23ins wide X 24 ins deep X 32ins high. 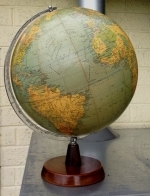 LARGE PHILIPS 14INS TERRESTRIAL ATLAS WORLD TABLE GLOBE In Superb Condition. 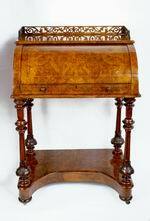 Antique small inlaid mahogany writing desk. Superbly Carved Rope Edge,Ebony Line To Sides And Ebony Edging To Drawers. Lovely Old Green Tooled Leather Hide With No Scuffs,Just A Little Shading. 54ins x 42ins x 29.75ins high. 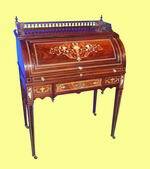 Stunning Antique King Wood Louis XV style bureau plat Desk. 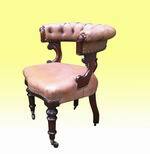 Shaped beautifully with serpentine sides and a tooled leather surface. 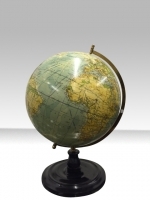 Wonderfully grained with Rosewood and Kingwood that are edged by a band of brass. Functioning oak lined drawer to one side and a corresponding fake drawer to the other. 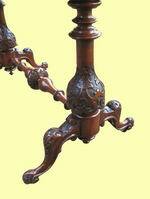 Cabriole legs with bronze gilt shell-crested espagnolettes. 29in high x 48in x 22in. 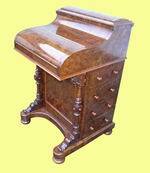 Superb small Victorian mahogany twin pedastal antique cylinder desk, galleried top . middle section has slide out desk top with reading slope with six small drawers and pigeon holes, six drawers to bottom of desk. 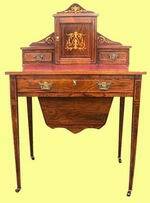 Magnificant Inlaid Burr Walnut Antique Kidney Shaped Desk. 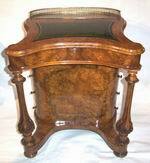 Magnificant Antique Burr Walnut Davenport.